Working in local West Berkshire schools goes on…and Kath and I can’t get enough of it! We started another busy week at Welford and Wickham Primary and they brought across their sister school, Stockcross Primary. The two KS2 audiences of around 60 pupils combined beautifully to set the scene for one of our dramatic Mokee Joe presentations. The weather outside was dire…incessant pouring rain. But inside Welford and Wickham primary it was a very different atmosphere – spooky, humorous and, most important of all – great fun! whilst driving up and down the A34, but this time we headed off to find out what this school was like. We were not disappointed! 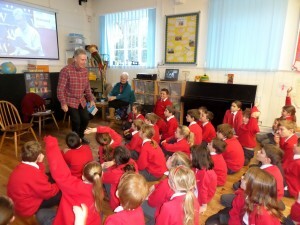 We found the school full of avid readers and with a Headteacher with northern roots (Lancashire)…we couldn’t go wrong! Again we used Mokee Joe to stir up our audience, and the book-signing the next day almost broke records! Many of our new fans presented us with work of their own based on Mokee Joe and I took a pic of some of their efforts…hope you like it. Big thanks to Ellie, Evie, Nathaniel, Grace for their artwork and to Maxwell, Mostyn and Eliot for their great 3-d model of Mokee Joe. and kept leaving the audience on cliff hangers. Needless to say, the pupils were desperate to get hold of the book the next day during our signing! A big thank you to everyone at Long Lane for making me ‘Author of the Month’ and for putting upwith all my scary antics! author career some 12 years ago. Mrs Devine has long been a fan of ours and it was great to meet up with her again out in the wilds of the Newbury/Reading borders. 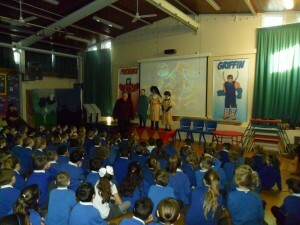 The school loved this, our first visit, during which we wowed them with Mokee Joe. 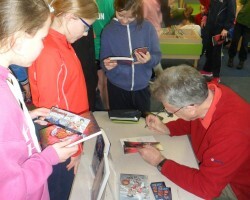 And the signing on Friday morning rounded off a perfect week – so many books signed for such a relatively small school! Thank you to all staff and pupils at each of these fab local schools. I feel confident in saying a good time was had by all…and certainly a good time was had by us. See you all again soon. The days are dark, the weather’s dire and it’s Blue Monday tomorrow. But guess what…Kath and I are having the time of our lives! We kicked off our new term to a blistering start by visiting three new local schools (new to us!) – Spurcroft Primary in Thatcham, Birch Copse Primary in Tilehurst and Inkpen Primary…in Inkpen! In between these visits, we visited our old friends at Francis Baily Primary and did a morning workshop with a large group of Year 3’s. …So a very busy week, but all very enjoyable and heart-warming to say the least. Each of our ‘new’ schools gave us a lovely welcome and it proved an absolute pleasure to introduce our Mokee Joe series to lots of pupils in KS2. The subsequent book signings were VERY busy and it was so humbling to chat and while away the time with our many new and enthusiastic fans. 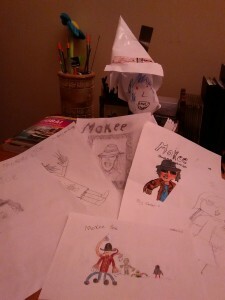 We were bombarded with drawings of Mokee Joe, ideas for stories and loads of questions about me and my books. It was easy to see that our new fans were more than inspired. Kath and I would like to express here in writing our thanks to Cath Airey, Kevin Cooling and Jane Kanisius for being such great hosts during our visits. We hope you will have us back again before too long to build on the great literary start we feel we have made at your lovely schools. BIG thanks to Mr Pilsworthy and the Year 3 teachers for ensuring our Year 3 workshop at Francis Bailey was such a success. We’re already looking forward to our next visit in a couple of weeks to view the work that the children come up with. …And finally…very best wishes to all reading our ‘dark’ books in the dark days ahead!